It’s the biggest fear people have about knee pain. 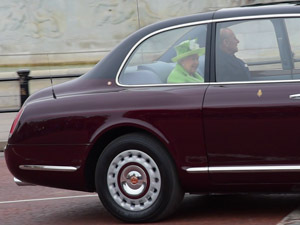 Earlier this year in London, I saw the Queen, Prince Charles, and Dr. Peter Malliaras. Only one of them came prepared with new insights about tendonitis. Dr. Malliaras, PhD, is one of the world’s leading tendinopathy clinicians and if you get the chance to take one of his courses, I highly recommend you do so. The two biggest aha-moments I had in his seminar fit the old “good news, bad news”-cliché. Let’s start with the bad news. As part of his work, Dr. Malliaras regularly performs ultrasound imaging. For him, it’s an important tool to reassure patients by saying “look, you’ve got 80% normal tendon” and to aid in differential diagnosis. Clinicians can see tendon pathology on ultrasound, but much like a shoulder with a torn rotator cuff can be pain-free, a pathological tendon is not necessarily painful. This confirms my patellar tendonitis treatment advice: “Just because you’re pain-free, doesn’t mean your tendon is healthy”, but here’s the bad news. Once a tendon has become pathological (i.e., the collagen alignment inside the tendon has degraded and other negative changes occurred), the pathological changes will not go away again. Once a tendon has become degenerated, it will stay degenerated, as shown by ultrasounds of recovered tendinopathy patients. These folks are pain-free and able to enjoy their sports without a problem, but the inside of the tendon has not returned to the pre-injury state. Here are my key takeaways from this. 1) Ignoring the pain is officially the worst way to deal with tendonitis, because of the high risk of doing irreversible damage to the tendon. 2) To prevent pain from coming back once you’ve recovered, keep doing strengthening exercises for your tendon. That brings us to the good news. The most popular exercise for patellar tendonitis is eccentric squats on a slanted board. It’s been around for decades and looks like this. A newer treatment approach relies on heavy slow resistance training (HSR), which you can do on the leg press machine, the leg extension machine, the smith machine, hack squats, and even with barbell back squats. If you look at the landmark study by Koonsgard from 2009, you’ll find that while HSR has a slightly better outcome in terms of pain scores at the 6-month follow-up compared to eccentric training, the difference is not statistically significant. In this study, some people did better on HSR exercises and others on eccentric training. The key insights in terms of outcome difference were that both, eccentric training and HSR, are superior to corticosteroid injections over the long-term, and that patient satisfaction was higher in the HSR group, because of the lower training frequency. 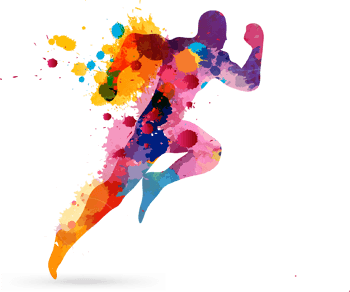 At the seminar, Dr. Malliaras said, “It doesn’t matter what exercise you do, people will get better.” That is, as long as you’re using an exercise that can be progressed and are not progressing too fast. Here’s my take on the advantages of heavy slow resistance training compared to eccentric squats. If you already have a gym membership and are experienced with the required exercises, HSR is a good option. If you’d rather train at home, eccentric exercises are the more attractive option. 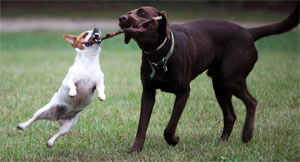 Regardless of which exercise you pick, be sure to move slowly and without momentum. You need to avoid flare-ups. The research is clear on one thing. Your knees won’t get better with resting. You need progressive loading. Let me show you a simple way to get rid of pain and make your knees strong again. Click here to get free instant access. 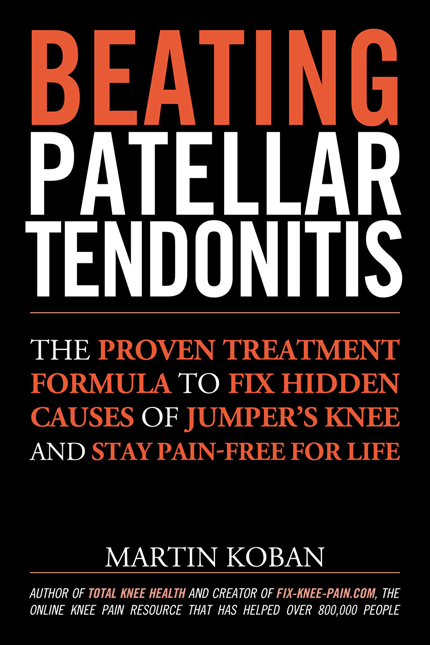 Learn how to get rid of your Patellar Tendonitis in this ultimate guide to curing Jumper’s Knee. 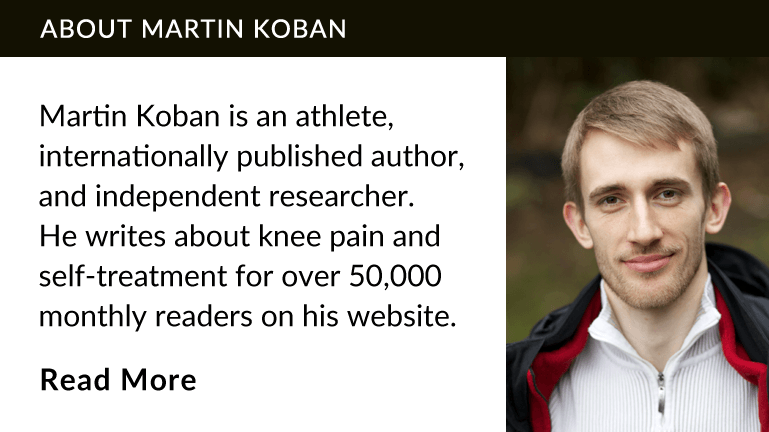 My name is Martin Koban and I suffered from patellar tendonitis (aka “jumper’s knee”) myself. I know how frustrating it can be and since you’re reading this, I don’t have to tell you about it. To cut a long story short, I almost quit sports altogether before I finally discovered a number of techniques that helped me heal my knees and get back to being active. I collected this knowledge through years of research and self-experimentation. The techniques you will learn on this page have already worked for thousands of people and professional athletes are using them as well. If you want to get rid of your patellar tendonitis, this is your holy grail. If you had jumper’s knee for a while, you know that ignoring pain doesn’t work, so what should you do if you feel pain during your training or even during rehab? Let’s talk about how you can recover faster by knowing when it’s okay to push through pain. Do you want get rid of your tendonitis faster? Join my advanced course today. Patellar tendon straps are small elastic bands you can use to reduce your pain from jumper’s knee. They sell like hot cakes on Amazon, but there’s a dark truth behind how they work. In this video, you’ll learn why patellar tendon straps are not actually helping you heal and what to do instead. To recover from chronic patellar tendonitis you need to strengthen your patellar tendon safely. The exercise I will show you in a moment will do just that. Using this exercise for patellar tendonitis has been shown to provide treatment outcomes equal to tendon surgery and it is supported by decades of academic research. Jumper’s knee is a stubborn knee injury that can take months to heal and even once it has healed, the pain might reappear after you return to your sport. The jumper’s knee treatment triangle will help you solve this problem by fixing the three most critical causes for jumper’s knee. In this article I will walk you through everything in detail. Keep reading to find out. Can shoes cause knee pain? 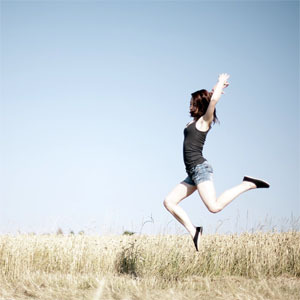 How can I get rid of knee pain FAST?